More people are starting to write SQL who have a background in programming as more and more people are analyzing data as data science related jobs are exploding. SQL is a little different than other languages and here are some common patterns which should be avoided. Here are 5 things, in no particular order, you can do to improve your SQL. There are a number of different joins you can use in SQL, but there are 3 common ones, Left Join, Right Join and Inner join. When joining two tables you will get only the records which match with an inner join. Any records which cannot be joined will be excluded. For this reason, many people only write left or right joins which automatically return all of the rows in the left or right hand side, respectively. These joins are always slower that Inner joins, and may not be necessary. Evaluate your joins to see if the record count changes if you do an inner join before you do a left or right join. SQL is designed to process data in sets, not one record at a time. In fact, it does not work well processing one row at a time. Looping through records one at a time in a cursor or a while loop is to be avoided. Think about how you might write the code so that it processes the records at one time. SQL is not an object-oriented language. This means the performance and readability does not improve when views, stored Procedures Or cursors are called from other objects. Try to do all of the work in one place. For more information on nested views, check out my post on the topic. While you can get away with using spaces or reserved words by putting the name of the column in brackets, most people are not used to writing code this way and it is inevitable that someone will leave off the square brackets and the code will not work. Have pity on those who will be supporting your code and do not include spaces. If you are unsure of what the reserved words are, see if they change color in the editor. Someone who attended I taught a class recently told me that they didn’t think that it was possible to write a stored procedure without a temp table because all of the stored procedures at her work had them. A common pattern which I see is to processing a bunch of records and putting them in a temp table, then processing them again. This pattern should be avoided. You can process records in one query. Look at writing more complex queries which look at all of the data in one query. Sometimes all it takes to figure out how to write SQL using sets is to have someone show you how. If you are in Phoenix, I can show you how on February 5th when I am doing a talk at Galvanize on this topic. I would be happy to show you some tips and tricks which would help gather and analyze data for an experiment. Not in the area or can’t make it? Check out my class at DataCamp. You can try the class for free to see what you think. I look forward to hearing your feedback. Recently I talked to someone about a view calling another view, a practice which is known as nested views. TL;DR Do not write Nested Views. Give this person a little credit, he had heard it was a bad idea, but he had a really good reason. There is no such thing. There is also no reason to take my word for it. Here are a number of other very good posts which detail why nested views are bad from a performance perspective. I understand that on the internet, no matter how cockamamie your idea is, you can find someone or some post which will agree with you. That is why I trust sources who I know and trust rather than the random chatter of places like Stack Overflow. In addition to the performance reasons, there are other reasons not to use nested views. Supporting and maintaining nested views can be a nightmare. If there is an issue with the accuracy of the data, finding the problem is just that much harder. And what about when one needs to go investigate or fix a problem? Then someone has to test all of the places the view is called. I worked with some code recently where a view was created on a set of data just to create 3 new values based up 3 case statements. That view was nested many levels below where the field was actually called. I know people from a development background look at nested views as modular development. Don’t. TSQL is not the same as object oriented code. Views are not always a bad idea. If you are creating an Analysis Services or Power BI project, it is a good idea to create views of the tables you are going to be using, even if there is no difference between the view and the table. Why? That way if the table is changed, your project will still work. Exposing a single view to users who are going to use self-service BI against it can also be a good idea. None of these are reasons to nest views, ensuring that the source data is anything other than a table. It takes a while to learn how to write good SQL and I have seen people rely on a view because it takes a while longer to write good SQL. Relying on a view though is like having one tool in the toolbox. 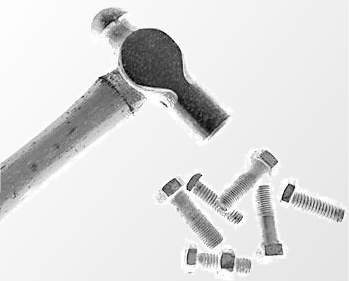 If you don’t have a screwdriver, one may be tempted to use a Hammer instead. Too often nested views are written because sometimes writing SQL is hard and it is easier to just write a query and save it as a view rather than use a CTE or a derived table. Do not succumb to the temptation. There is a lot of code written where someone as in a hurry and they were planning on going back and fixing it someday. Someday appears with the same frequency as a lottery. Make it easier on the person who has to figure out or maintain the code left in your wake. Don’t write nested views. Your replacement will thank you for it. Until recently, I hadn’t used the Transact SQL TABLESAMPLE clause, but I ran into a situation where I needed to test some things and not wait all year for a result. TABLESAMPLE to the rescue. There are a couple of things where it won’t work. If you have derived tables, tables from a linked server (bad idea), or are writing a view and you want to return random data you can’t use TABLESAMPLE. If those conditions do not apply, you can use it. The random sample that TABLESAMPLE provides is based on the number of data pages, not the number of records. If you want the number of rows to be specifically limited you will need to use Top(n) as well. I’ve written all my samples based upon AdventureWorksDW so you can run them for yourself later. I’ve listed the variety of ways to call TABLESAMPLE and shown the number of records returned. Let’s say you want to return the same sample set multiple times. For that you will need some value. I picked 11, but you could pick any other you like. When looking at the number of records returned, the values are not 10 percent exactly or particularly consistent in the number of rows returned. If you only want 6039 records returned, you can try the following code, but it doesn’t really do what it says. This code will provide the exact number of records desired. Noticed I upped the number of rows returned in order to get 6039 rows. If the sample is 6039 you cannot guarantee that you have enough rows returned. TABLESAMPLE has some really useful functionality, but for machine learning I need a truly random sample, which TABLESAMPLE does not provide. For that I need NEWID(). The following sample returns approximately 1% (.01) of the 60398 rows. Just for fun I ran the same code 3 times and got a variety of rows returned. The ProductKey is added so that the NEWID() function will calculate a sample for each row. The WHERE statement calculates a random float between 0 and 1. This will truly give me the random sample I would need for a machine learning experiment. I am looking forward to SQL Server 2016, which includes an update to DAX which will generate dates for you, but since it hasn’t been released yet, the need still exists to create a date Table. 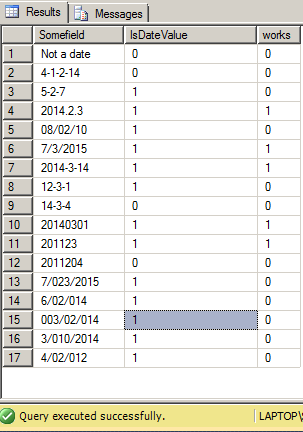 Since I am creating a Tabular Analysis Service instance, an identified date dimension is needed for time functions. There are a number of different ways to create a date dimension, here I am going to take advantage of recu There are a number of ways you can create a date dimension, here I am going to describe a neat way of creating one using a recursive CTE, which decreases the SQL code required to generate one. There are a number of fields which are pretty standard for date tables. The fields can vary if you need to add things like Fiscal years or Month End dates which have business specific rules like last Friday of the month. The most common fields needed for a Date Dimension are listed here. QuarterName – First Quarter, Second Quarter, 1 Qtr 2015, First Quarter 2015 are some of the ways the name is listed. Pick whichever format people would like to see. MonthNumber – 1 for January, 2 for February, 3 for March etc. NameMonth – January, February, March etc. WeekDayNumber – Date of the Month. July 4 would have a 4 here. NameDay – Monday, Tuesday etc. DayNumber – Whether you choose 1 for Sunday or 1 for Monday is a business rule you need to find out first. This example shows 1 for Sunday, 2 for Monday etc. As a best practice, remember reserved words such as DATE or Index or any other word which shows up as blue or pink in SQL Server Management Studio, should never be the names of any columns. Always select a name other than a reserved word when creating tables. Also friendly names containing spaces are great for exposing to users, but they are annoying in SQL Server, so leave the spaces out of the column names. Evaluate what dates you are going to be needing in the table so that you don’t have to go back and redo it. I am creating a smaller table here, but that is just because it is an example. Look at the dates you will be storing in your data warehouse when determining your starting dates, and set the end dates for probably about five years longer than you think the data warehouse will still be in use. CTEs, which Microsoft added in 2005, is a great way to generate a date table by harnessing the power of computer to spin through your code, decreasing the need to write a lot of code. I am using a recursive CTE method here first published by Itzik Ben-Gan to generate the number table being used in the code below. After running this code you will have a date table created and loaded. IsDate is an often used feature used in TSQL to determine whether or not a field contains a date. I am sure there are a number of people who have used this successfully and may wonder what I could possibly be talking about. To maintain my technical bona fides I’ve included some code, which you can run inside of SQL Server Management Studio. It is obvious by looking at my example, that some of the values inserted into the temp table @validDateTest are not dates. The code below the insert statements will Convert only the values which IsDate says are dates, not all of the values as I have a where condition in the query. The values that will Convert without giving me an error have a works value of 1. If you run this query, you will see the difference in the values returned by IsDate, and the values I have provided that work without returning an error. If you are fishing around for a solution, the simplicity of this will probably make you smack your desk. Now ideally, the source system should be fixed, as it really should be making sure that the dates are valid. I can’t make that happen. But I do have a solution to resolve this problem, just Cast it. Cast and Convert are on the same page in Microsoft online help and a lot of the time you might think they are synonymous, but they don’t work the same way. This works with no errors whatsoever. Simple. Easy. If you ever run into this, I hope this saves you some time.